Passenger counts are definitely irrelevant when it comes to the logistical restraints of track layouts. Adding a car or two to a consist has a negligent impact to track occupancy while a pretty significant one to passenger capacity. Number of moves over a given track and perhaps type of each (Pax vs. Freight) should be the only metric in determining rail traffic capacity. My point is not about the economics of fixing either choke point, but is asking how chokey a choke point can be and still be tolerable (it is both that N/R is bigger and therefore that the Salem tunnel may be the bigger choke point and/or that a single track section need not prevent growth) especially now that, for example, less-predictable Freights and Downeasters (or increased Lowell Line service to/from Haverhill) can use a two-track wildcat to clear Ballardville (when Boston-bound) or wait for it (when Portland-bound) without fouling things between NH and Wilmington. BostonUrbEx wrote: Also would like to point out that the Ballardvale single track is longer than the Salem single track. Counting thru trains, locals, the gravel train, extras, light power moves, etc I would guess an average of @ 12 Pan Am movements per day. The Ballardvale gap is physically and visually small, but the double track from the station north is unusable for some distance until you get to the new crossover at Vale. (i.e. it essentially dead ends at the station). Not sure if that's the case south of the station. Another thing to consider is that Pan Am's main line merges right into the middle of this whole mess on a very sharp, low speed curve which makes for a slow and arduous process of clearing the single track. Last edited by roberttosh on Mon Jan 01, 2018 4:54 pm, edited 3 times in total. Is there still an early morning deadhead move out of BET to Haverhill for the AM rush? Rockingham Racer wrote: Is there still an early morning deadhead move out of BET to Haverhill for the AM rush? If the long & slow movements "count for double" we'd roughly have a tie. I'm not sure exactly how many trains now. I believe it's POSE/SEPO, POED/EDPO and perhaps LA-1? I'm probably missing at least one additional pair. That would mean about six freight trains a day. Poland Spring could be a lot more. Perhaps an additional six trains a day (possibly as many as ten). Others have rightly noted that it would seem impossible now or at any time in the future for Pan Am to staff and operate so much traffic from District 1 (or anywhere). gokeefe wrote: I'm not sure exactly how many trains now. I believe it's POSE/SEPO, POED/EDPO and perhaps LA-1? I'm probably missing at least one additional pair. That would mean about six freight trains a day. There's the gravel train that runs several times per week, the weekly limestone slurry train, an occasional WAAY/AYWA or AYPO/POAY symbol and maybe another local thrown into the mix though am not sure on that. Less frequent would be light power moves, the OCS, welded rail trains, empty unit tank train storage moves, haz-mat extras, etc. A move's length of time over a segment of track denotes it's occupancy. Not just the quantity. Keep in mind the occupancy of the single track is the extreme end of the interlockings at either end, because once a train hits the interlocking they have to clear the next one completely until another move can happen (except in the case of low-speed following moves). Here's how we look at it in the industry. Believe it or not, the Ballardvale gap is slightly longer than the Salem gap but has higher track speed, and both have a station. They are about the same duration for a passenger train. Salem - 70 moves on a "peak" day, all short and fast - 5 minutes or so, a handful maybe less. 67 revenue, 1 non-revenue, 2 Pan Am locals (short locals). Ballardvale - 54 moves on a "peak" day of varying length. 30 revenue, 2 non-revenue, 10 Amtrak, 6 Pan Am "locals" of varying sizes, 6 Pan Am road freights of larger, variyng sizes. All the moves through Salem equate to about 350 minutes of occupancy (70 x 5). The 42 passenger trains through Ballardvale equate to 210 minutes (42 x 5), and if you want to split hairs anyone not stopping can shave up to 2 minutes off. So this could be anywhere from 186 to 210 minutes. Pan Am locals on the Haverhill Line can vary greatly in size - from 5-6 cars all the way to 20-25 cars (I'm counting the gravel train as a local here). So the time it takes to get through Ballardvale can run anywhere from 5-10 minutes. This can also depend on the routing, as coming towards Boston has a higher speed than heading towards Lowell. So that's anywhere from 30-60 minutes of time consumed for 6 trains. Pan Am road freights also vary in size, but assuming on the larger size the can occupy the track for anywhere from 15-20 minutes. So now we're up to 90-120 minutes consumed for those 6 trains. Adding the highs and lows, gives anywhere from 306 to 390 minutes of occupancy on a given day of "normal" operations. Hate to burst the bubble here. Ballardvale is not the only issue on the Western Route. Stations on ONE side and not on both main lines east of Ballardvale creates a choke point. It is basically single track for the Commuter train perspective. So Salem is not close to a comparison. The fact that at the South end of the gap you have 3 single track main lines, one exclusively used by the T, one exclusively used by Pan Am and one used mainly by Amtrak and to a lesser extent the T, all squeezing into that single track segment must be a dispatching nightmare. As sery2831 points out, as it stands now, I believe the T operates as single track all the way to Lawrence due to the situation at Andover station. If things pan out with Poland Springs, you're probably talking about another mile long train per day getting thrown into the mix. Also, does Ballardvale have the need for more opposing meets due to Amtrak and Pan Am movements which aren't skewed towards inbound in the AM and outbound in the PM like CR? sery2831 wrote: Hate to burst the bubble here. Ballardvale is not the only issue on the Western Route. Stations on ONE side and not on both main lines east of Ballardvale creates a choke point. It is basically single track for the Commuter train perspective. So Salem is not close to a comparison. This is a alternative way of asking about the ease of closing the gap in single track @ Ballardville: should I think of it as easy (because the gap is small and the crossings are simple) or should I think of it as hard (because real double tracking takes new crossovers and station changes)? Trinnau wrote: All the moves through Salem equate to about 350 minutes of occupancy (70 x 5). [All the moves through Ballardville equate to] 306 to 390 minutes of occupancy on a given day of "normal" operations. Thank you very much for putting numbers to the occupancy of the chokepoints. It certainly shows that on its bad days, Ballardville can be worse. gokeefe wrote: Poland Spring could be a lot more. Perhaps an additional six trains a day (possibly as many as ten). Others have rightly noted that it would seem impossible now or at any time in the future for Pan Am to staff and operate so much traffic from District 1 (or anywhere). How free is Pan Am to load those new trips onto the line without regard to how much congestion such trips will cause and without paying enough that the MBTA could finance upgrades from expected freight fees? The station problem obviously creates more expense but even without that work am guessing having the ability to keep Amtrak and Pan Am movements out of the way of CR would be a huge help. If they double track through Ballardvale it creates an immediate problem though in that the station as it currently stands would only serve the new Eastbound track, while beyond that, Andover and Lawrence are served by the existing Westbound track. 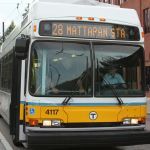 Arlington wrote: How free is Pan Am to load those new trips onto the line without regard to how much congestion such trips will cause and without paying enough that the MBTA could finance upgrades from expected freight fees? I simply don't know. Others here probably have a much better idea.